Mercy and Dorcas Lesengei are Karate twins. Aged 9,they are barely starters wearing yellow belts, tied crisply with square knots. But the duo present a perfect tale of two little sisters doing sporty moves in unison. But watching them go through their choreographed Kata and Kumite-the routine demonstrations and sparring, it is easy to tell that they are not pushovers. 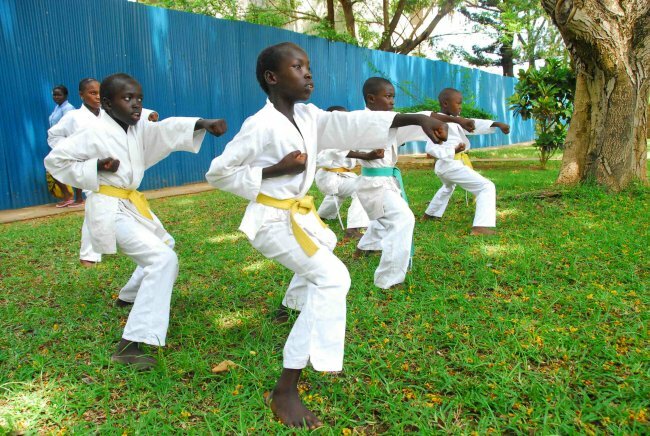 Their petite frames might make them look like amateurs, but their quickness and agility with their Karate moves makes them stand out in a group of children. "One reason I like to do karate is, after all the practice and training and doing well, you get a reward," said Dorcas. 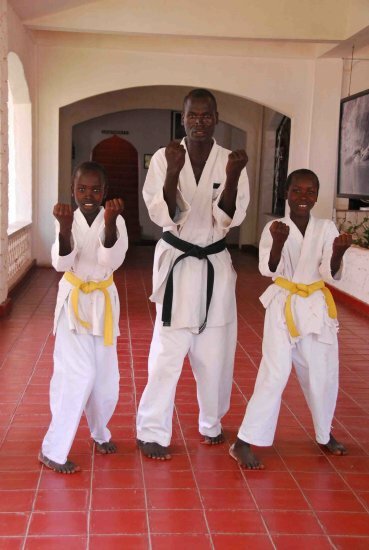 Their dad, Joseph Lesengei is the instructor guiding the small group of youngsters through their demo at the official launch of the World Club Karate-do Championships set for March 2011 in Malindi. It is a crowing moment for the family with cameras clicking away as they go through the formalised patterns, showing their skills and flexing their muscles. “There is a going to be a very big event here in our town in the New Year,” said Dorcas the more outgoing of the identical twins. “Our dad might be competing because he is a blackbelt,” adds Mercy beaming with pride as she talks about the man who introduced them to Karate three years ago. Lesengei, 35, a Malindi resident who hails from Samburu is also the coach at the local club. He has represented the country at various national and regional championships and opted to introduce it to his twins so that they can also reap from the health and social benefits of the martial art. “Like any father I wanted the best for my children so I decided to teach them Karate. It has helped with their discipline and overall well being,” Lesengei noted clearly pleased that his twin daughters were receptive of the sport unlike their other two siblings. Working as a night security guard he swears by Karates’ benefits especially in self-dense skills, which are essential in his perilous job. The small touristic town popular with Italian tourists will play host to the world club event-the first time that the event will be hosted within the region. An impressive 22 countries have confirmed participation in the weeklong event to be held at the Blue Marlin Sports club. “Top Karate nations like England, Russia, Brazil have sent in theirconfirmations for the Malindi event. I see it as a perfect promotion of Sports Tourism,” said Caleb Atemi the Chairman of the Kenya Karate Federation. Atemi hopes to use the event to also create awareness around Karate Do and its numerous attributes. “I have set aside an outdoor area near the beach to be used as the venue for this event as a start towards making the event a huge success,” said Roberto Marianni, the proprietor of the Blue Marlin sporting club. The event will wholly rely on corporates, as Government support towards such small disciplines is limited. “We are hoping to raise about 20 million shillings, big target, short time-but March was the most suitable time to host the event without interrupting the international calendar,” said Atemi. Top Sensei(Instructors) from Japan and Italy including Kenya’s Anderson Katana and Bon Owiti will lead the competition for top honours in Kata and Kumite, an ideal exposure for hundreds of black and brown belt holders like Lesengei a chance to compete against the world’s best.